Any business with a need for mobile or web invoicing and customer management. Home Service Professionals. Any kind of Contractor where there is a mobile presence for Field Services. Get Paid Faster & No Subscription Fees! Easy mobile and web invoicing with payments. 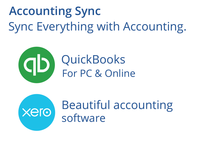 InvoiceASAP syncs with all versions of QuickBooks for PC (Desktop) 2008 - Present, QuickBooks Online, and Xero. Create professional invoices, send invoices, accept mobile and web payments. 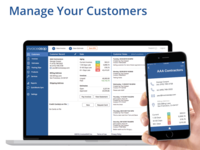 Easily manage customers and sync everything with accounting. FREE SUPPORT! In the past 2 years I have saved significant time by using InvoiceASAP to manage my invoice process. 1) Easily access all of my client data whether at the office or on-the-road. Having client service history available is extremely helpful. 2) Quickly create an invoice in 5-10 minutes (Depending on how much info. I want to include in the notes). I prefer to create invoices using the web portal but it also can be done from a mobile device. 3) Easy to email and track client invoice status (Sent, Opened, Paid). 5) Very reasonable yearly subscription fee. 6) Since switching to InvoiceASAP in January 2016 I have saved significant time on managing the invoicing portion of my business. 1) Can only accept credit cards/debit cards using Global One Pay. This change was made last year. Prior to the change you could select from multiple payment gateways (PayPal, Square, etc.). I will add I have had no problems contacting and working with Global One Pay. 2) The notes section of the invoice form only accepts plain text (no HTML, bold, italic, etc.) and is set at a narrow width. I know it would add a level of complexity to the software to add these features this but it would allow the creation of better looking invoices. 3) QuickBooks sync can be a little slow at times. Overall: Invoice ASAP saves me a lot of time managing my company's invoicing process while providing easy access to all of my customer information. Overall experience is great. Great product for small businesses. 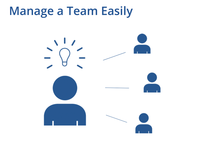 Pros: Easy to use for our team members. Clean. 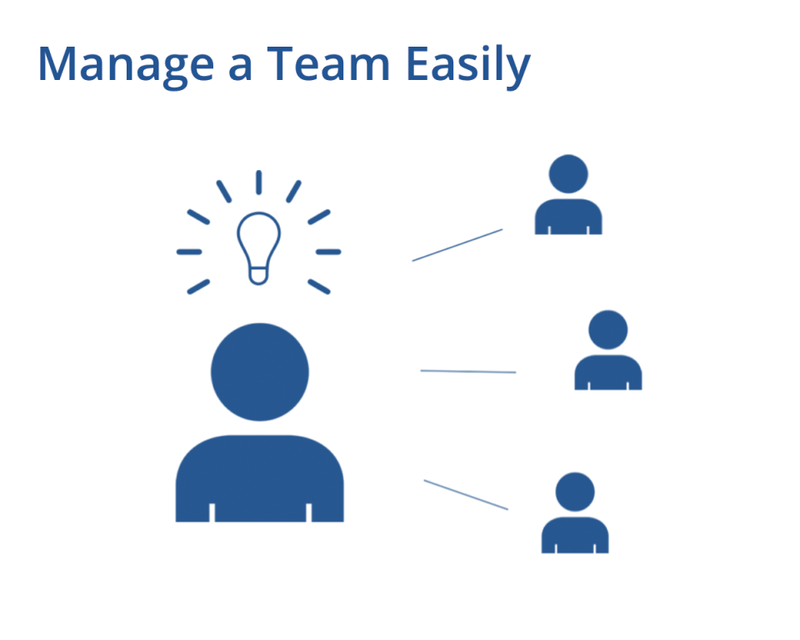 Onboarding is simple. The syncing seems to work very well, system improvements have sped up the process. Connects to printers well. Cons: Only one type of printer can be used imz320 and the 2" version. Need quicker response on support issues. When an employee is deactivated, I would like to get them off the screen, but their profile sits there, lingering like an ex-girlfriend. The reports section needs work, you cannot use back button on browser because it gives database error. More report options about specific customer sales for a specified period or product sales breakdowns (how many of each product did a user sell in a specific period of time). How much product or sales at a Customer Job/Location. I would like a backup option for all the invoices with signature - we have a roundabout way of saving all invoices to server, but there should be a backup option if something was to happen to InvoiceASAP servers. Monthly Projected revenue email is a little low most times, so it is like reverse psychology. Would like to create dashboards to display around office for our office team to see daily sales, or yesterday sales, etc. This would mean data needs to be exportable or in API form. Overall: We get to connect to QB desktop easily and add customers to the system quickly. Very accurate. Pros: Integration with Quick Books desktop was key for us after QB discontinued its app, so having the ability to have customer info and invoices with us at all times is great. This was the main reason we chose this software and it has been very beneficial just for that reason. Cons: We have had a few issues with payments not applying in the InvoiceASAP software from Quick Books Desktop, so I always double check to make sure a client actually owes what is showed. I also wish the software had the ability to import estimates from Quick Books and not just invoices. It exports the estimates you make in the InvoiceASAP software without any issues, but does not import the ones made on the desktop Quick Books. The only other feature that would be helpful to our situation would be the ability of the software to import expenses that are associated with a client and then be able to put them into the invoice. For example, if we purchase an item for a client and then input the item into Quick Books as a billable item, the only way that we can bill the client for the item is to invoice it from within Quick Books by using the Add Time/Costs option, as this option does not exist in InvoiceASAP. Really good way to get organized and efficient, fair price and no issues. Pros: I like the the features, from the graphs, to sales updates, the simple and user friendly interface, and much more. All in all, this is a Must if you plan on running a business. Overall: In the beginning I relied solely on notebooks, and when you have kids who doodle, things can get really chaotic and organization goes out the window. I began losing jobs because I was forgetting to call people back, and following up with existing customers became a chore to remember. Financial issues like remembering what was paid/owed was too much to take. Literally 1 week after purchasing this product my stress level dropped and efficiency rose. When time is money, using it wisely puts more money into your pockets. Its been over 3 years and wouldn't use anything else. This software has been a game changer for my handyman business! Pros: I like the ability to quickly and easily create invoices and estimates. I also like the ability for a customer to pay via credit card thru the invoice and love the ability to have the service fee passed on to customers for the convenience of using a credit card. I have only had one customer ask about it and it wasn't a big deal, they just chose to pay with a check. I also like the ability to quickly see outstanding invoices and also monthly and yearly snapshots of sales/income. Cons: I have had issues in the last few months where I would create a new invoice through the website and then it would just hang and not save. No issues using the app though and there is even a link to the app I can utilize on my pc that seems to work well. That's the only complaint that I have though. Wish they could figure out why it occasionally does this! 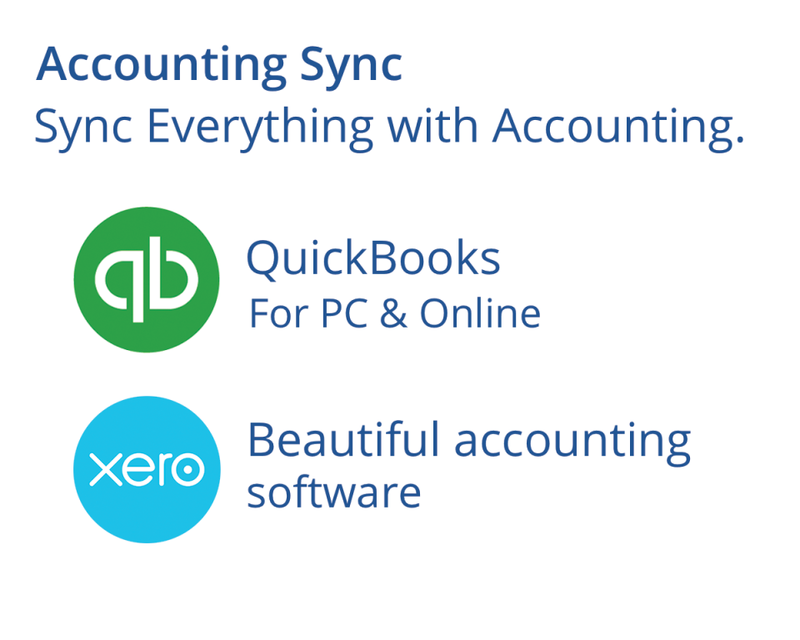 Overall: Huge time saver and love the ability to sync with Quickbooks! Pros: It is very simple and easy to use. I really like that after I post a payment to an invoice, the customer can view that the invoice is paid. This app has a lot of features, and although I do not use all the features, I like to know those functions are there in the event I need them in the future. I also really like that I can view my account on any web connected device (ie iPhone, Android smartphone, tablet, laptop, desktop, etc). Cons: As of right not, there is no offline mode, this makes the service unusable if there is no data connection while in the field. There is no fingerprint sign in option on android version. Sometimes refreshing the android app takes several minutes. The android app runs slower than the iOS app, from my experience. Overall: I run my mobile small business from my smartphone and this allows me to keep a paperless invoicing system. Professional look and ease of use to collect and close jobs. Cons: The software is basic if that is what you are looking for. Would be nice if you were to develop and basic scheduling software that would work together with Invoice ASAP that way you would put the customers info only once. Overall: Organization, money flow, tracking customers not paid, customers being able to pay online with out having to contact me for payment and taking my time up. 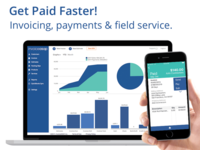 Mobile QuickBooks Accounts Receivable without another QB license! Pros: I use InvoiceASAP daily to access Customers and create invoices on my QuickBooks Pro Desktop system. It is the best solution for mobile invoicing. 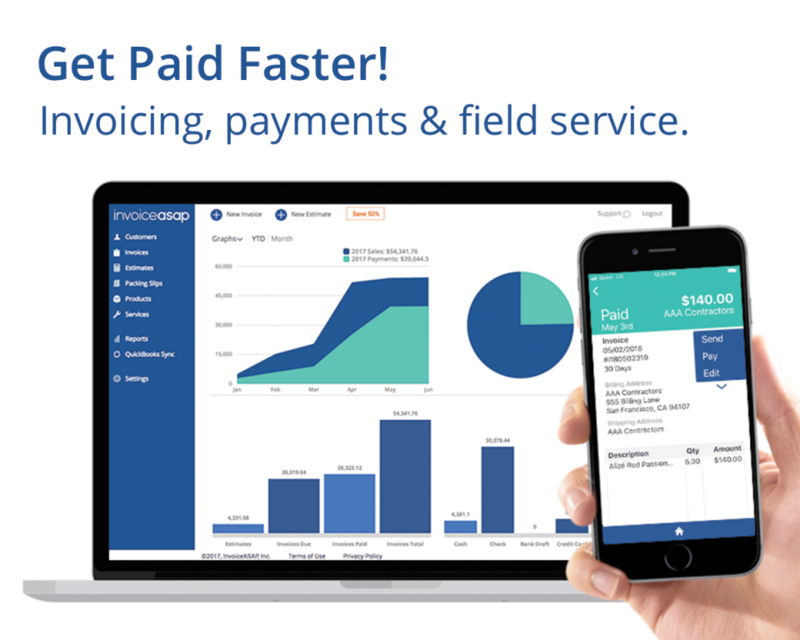 InvoiceASAP integrates with QuickBooks desktop versions for Customers, Invoices and Estimates at a fraction of the cost of another QuickBooks license - and it works on my smartphone! Cons: There are fields in the QuickBooks invoice that do not correctly follow what the defaults are set in QuickBooks. I have had issues with email addresses, item prices and taxable status not using the settings in my QuickBooks system. I can override what InvoiceASAP prefills in these fields with the correct values, but it would be better if InvoiceASAP accepted that the QB values are to be used. Pros: stores client and product / service info making creating invoices quick and easy. The various automatically generated reports make staying organized easy. Square space integration makes client credit card payments easy. And most importantly,, having up to date invoices on my computer and all my devices is a big plus. Cons: Ive has issues in the past with sending invoices via the app. So to get around this ive been creating PDF's of invoices and sending them with a standard email. That being said, its been over a year since I tried sending an invoice with the app so this issue may already be fixed. Overall: increased my organization, gave my business a more professional image and makes accounting easy. Pros: It synchronizes immediately across all devices so your information is up to date regardless if you're on the phone, tablet, or pc. With an easy to use and intuitive interface, it's painless to set up and start using right away. It has the information you need on the go without a bunch of extra bloat and superfluous features to confuse, clutter, and take up space - It's streamlined to do what it needs to do quickly and with minimal time spent navigating the program. Best of all, it syncs well with Quickbooks and the process is simple to set up and run without jumping through a bunch of hoops. Cons: I am not a heavy user and I'm sure some people would like to have more features, but for what I need it for, it gets the job done and I really don't have much negative to say. For me it would be nice to have the option to save a list of comments/notes that you use often in order to save time. Adding the ability to create a drop down list of canned comments would be a very welcome addition. Overall: Makes estimating and invoicing easy, mobile, and quick. I can give an estimate or invoice on the spot, so customers don't have to wait and I don't have to spend time on the computer later. Pros: The ability to upload lists and data from excel. It is also very easy to navigate previous invoices or account information for customers. Cons: It would be nice if there were simultaneous lists available for different type of customers. When creating an invoice I like to quickly navigate through items. We have different pricing based on the type of customer you are and/or how much you purchase. It would be nice to be able to store pricing data based on the type customer you are. (level A, level B, etc..). Overall: The ability to keep our wholesale and landscape customers separate from our normal customers is nice. It allows us to quickly and easily invoice customers. Pros: InvoiceASAP has been very beneficial to us when we have a need to collect payments from our donors or other who purchase anything that our agency makes available for sale. We use Square as our physical POS and we also use Square for our online payments, but InvoiceASAP is our go to when we have a need to send an invoice to someone for something that we don't have online payments enabled for. A few clicks and the invoice is on its way to an email inbox, and a few more clicks and our customer has paid the invoice. Couldn't get much simpler than that. Cons: We kind of felt as though the packages could have been allowed differently, giving the free version more than 5 invoices per month. But, even though we had to subscribe to be able to send more invoices, it wasn't an extremely high cost. Overall: We thoroughly understand and use Invoice ASAP with no issues, and the experience had been beneficial. Absolutely love using Invoice ASAP for every aspect of our business it does us well! Pros: The invoicing is made simple & easy with no issues ever. To mark paid is simple as entering check number or cash! and to send paid invoice to each customer is just as easy with a simple click on the send button! LOVE THIS SOFTWARE for everything it can be used for. Cons: recently changed to the drop down list and how you add new items it sometimes doesn't allow you to save the invoice if there is already that name & price for a certain item. But other than that no complaints. Overall: Easy invoicing. Easy Storage for all Customer info and invoice history. Pros: Customers like the instant invoice email, inventory is easy to track, easy to set up with new products. We use it on portable and desktop devices. Cons: Can no longer do hyperlinks to separate invoices. Last year we could. This was a loss for us. Customers can sign on portable devices, but not on a desktop touch screen. The -/. symbol on the keypad is the same key. Finally figured out that a double tap got us the - sign to document returns. Overall: Tracks our inventory, issues customer invoices on the spot, customers get their invoices emailed instantly. Pros: I have been a customer of invoiceASAP for a little over a year and a half. During this time it has been a great tool that my customers love and very handy that I can send a bill to be paid instantly as well as estimates to be viewed. Very easy to use and track invoicing and receipts. Pros: I especially like the ability to issue invoices & email them to customers, process receipts, and export reports into Excel. It is also wonderful that it syncs with QuickBooks saving me duplicate entry. Cons: Occasionally the export into QuickBooks for payments received will not send all the payments over. It is pretty rare, but odd because the payments are booked in InvoiceASAP, yet never show up in QuickBooks. I just manually post them in QuickBooks. Overall: Ease of syncing with QuickBooks, saves us from duplicate entry. Cons: lacks of functionality the sync in quickbooks took 2 whole days and never sync up also it should include inventory management and be able to refresh fast on android version and in last update they took out print preview and pdf download the concept it good but need to upgrade I paid monthly and this app is limited for the price. Pros: For what I need in my business, this is an easy to use App for invoice application When a customer needs an invoice/receipt, this app produces a professional looking invoice/receipt. Overall: A professional looking invoice/receipt with a direct connection to your bank account. My experience with IncoiceASAP has been outstanding. Pros: The software is easy to use, easy to keep track of all invoices, products, service, bill customers and see growth in my business. Cons: I would honestly say I really don't have any cons at this time. If I had to suggest any changes, it would be in the report's. When you are trying to print the sales growth, you do not get to see the total monthly sales on the graph. Overall: Ease of use creating Invoices to look the way I want them too. Also an easy way to add product and keep track of prices and customers. invoice ASAP saves me a lot time entering invoices and also getting paid faster. Used it for a few years. Works well and makes invoicing easier. Pros: Easy to use. I have used it for a few years and works well to add and syncs with QuickBooks. They do updates sometimes and I feel like there always looking for ways to update it. Cons: Long time to sync. Needs more flexibility in sending invoices. It would be helpful to have it send the attachment but still come from one of our own emails. Then it would be easier to track sent emails and to have proof that we sent it and to where. Cons: We run a honey delivery business. All of our stores require us to credit/return items on somewhat of a regular basis for damages, ect. There is no way to create a credit with invoice ASAP. We still have to hand write and enter at the office all of our credits. The other problem we have is your app crashes when it looses phone signal. Offline useablity would be great. 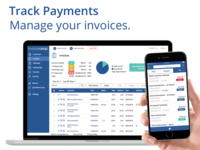 Overall: Easy invoicing and payment tracking. ASAP has been a great addition to our business. Easy to use and to sync with quickbooks. Pros: Easy to use it and manage your clients and products. We are in direct sales and have about 20 products and close to 80 clients. Invoice ASAP has been much reliable in our business. We could add a client or a product on the go, if needed. Support has always answered my questions in timely manner. Cons: My type of business we a re oblige to give credit back to a customer if a product spoiled and/or damaged. Invoice ASAP is not capable to apply any refunds/credit back to a customer. Overall: Easy to use and set up. Able to sync with Quickbooks. Fully Reliable. Works with a mobile printer like Zebra. Used for 4 years. Simplified our invoicing and record keeping. Won't go back to old ways. Pros: Simplicity of end user both in the field as well as how easy it syncs to quickbooks. I like how with one click it works on syncing. Cons: -- Sometimes it double invoices a client. -- I wish we could customize our invoices. -- it doesn't line tally. It only does a final tally for total billed amount. Overall: Simplified my tracking of what we billed out the most as far as our products and services. It also speeds up my ability to do quick books. Pros: I really like the fact that you can capture signatures in the field and it sync's nicely to my QuickBooks program. I also like that I can take pictures and attach them to the invoice for my customers. Cons: I wish I could customize the software a little better to my needs but I have adapted. I wish I could add a link to be able to accept credits cards through my merchant service account with another vendor. Overall! good product for my business, Save me a-lot of time invoicing my customers. Pros: Easy of use! History is at your finger tips all the time. Works with Quickbooks. Make your invoices and estimates look very professional. Cons: Sync with Quickbooks never complete syncs correctly. Comes back failed sync, all the time. Pictures don't always send with Estimates. Some customers email service block receiving invoice. 24/7 phone service would be nice. Overall: Professional results due to their product. i use this program everyday for my handyman business. Pros: I like the convenience of the program. I like the speed of the program, I like to be able to store the info in the cloud. I also like the cost and being able to use it all I want for a single price. Cons: it is very difficult to edit after you save. instead of rewriting 1 word you have to type in the whole item sentence all over again. not very iPhone and safari friendly. Overall: my business runs more efficiently. Pros: SOOOO easy to use and set up. Payments are easy, and the mobile site is great as well. We also integrate with Quickbooks which is great! Cons: Reporting could use a little work, can be confusing at times. Mostly with the exporting feature, it pulls in all of the info sometimes instead of specific info. Overall: Ease of use, mobile options, available anywhere. We also use the payment integrated option which has really sped up payments. Pros: Syncs with computer, and QuickBooks. It's easy to edit and make invoices on the go. I like that it shows you if a customer viewed the estimate or invoice. Cons: Sync with QB could be better, it's a bit confusing when there is an error. I have made some mistakes trying to add products a few times by putting the description of the product in where the name of the item should be on accident. We have used this application for service for years. Always current and updates are over night. Pros: The cost is more than reasonable for the seamlessness into the office. Out in the field, and in the office with in seconds. No more waiting for invoices to be turned in from techs. The platform is wide open for customization. Cons: Nothing at this point. The service is very quick if there is ever a problem, which is about once every 2 years honestly. Overall: Alot les physical paper to keep up with. We are a distribution company and use the app daily, it has made our life easier. Multiple users in one company. Cons: Can not set up discounts at individual customer level for individual items. Desktop app hangs up a lot. Overall: We used to make either handwritten invoices or make invoices from office and then deliver to customers. Now we can make invoices on the go and it automatically syncs with quickbooks. GREAT value for the cost and great customer service over the last 2 years! Pros: Been absolutely great for alcohol distribution with the signature feature, which 95% of other apps don't have. Love the ability to edit most everything. Cons: Some things aren't easy to edit and must sign in on a computer to do so, and I'm always on the road, so that isn't the most convenient. Overall: Being able to process credit cards recently has been great! Able to edit most everything, constantly is a huge help. Cons: Sometimes it wont transfer information from quick book to asap. If you create an estimate in quick book wont show on asap. If you create a customer in asap with out an invoice wont show in quick books. If you receive a payment through quick books wont show on asap. Best thing to happen to invoicing since carbonless copies! Pros: I have tried other invoicing software before, and they were limited, and often difficult to use or customize. Invoice ASAP is nothing like anything else I've used! Easy to set up, customize, and navigate. Making administration changes is quick and easy. Works effortlessly on all my devices and office desktop. Generating professional looking estimates and invoices in the field has never been simpler. Plus, customers appreciate the paperless format saving paper. Now that I have it, I can't imagine being without InvoiceASAP! Cons: Any negatives I had about InvoiceASAP were either corrected in updates, or from my own improper management of settings. Pros: it synchronizes with Quickbooks so I do not have to do double entries. I can see outstanding invoices at a glance and the reports show me how I am doing. Cons: The synchronization with quickbooks takes a little too long complete. It sometimes wants to refresh when I open it and it takes a few minutes at a point where all I wanted to do was to create and invoice. Works great, use it everyday. Pros: Easy to use. I personally use the App as the primary usage which is easy. Keeps track of the customers past invoices for years and also keeps inventory straight. Cons: You do not have a cost field for the products/inventory in the app. Where the website has the option for a cost field. That's really my only complaint. Overall: Easy use for invoices and inventory control. Good experience in the beginning. Pros: The software is pretty simple to navigate and I like that I can also access it from any web browser. Cons: The new payment system with GolbalOne is horrible. Please bring back Square payments. It was much better and cheaper option. I wish there were more options for reporting on the mobile app. The reports are limited. Overall: Makes it simple to create invoices on the fly. Pros: i ENJOY THE QUICK BOOK LINK, MAKES BOOKKEEPING A MUCH EASIER FOR EMPLOYEES AND DRIVERS . Ben using the ASAP app for 4 plus years. Easy to set up, use, and always works. Pros: Works, and captures signature. Over time they have only improved the app. Sync with quickbooks. No more re-entry of data when you get back to the office. Cons: Can take awhile to sync up with quickbooks. Not a big deal. Some times will have issue with cell connection. Not the apps fault, just reality of being mobile. Pros: The ease of use on the go and at office. I would like to be able to have the same option on phone as computer if possible. Cons: Not able to log same customer with 2 address without doing it under the job location. I also would like to have the ability to save card info with out being changed such high monthly amount. Been using for three years and nice to be able to invoice immediately after the job is done. This has been very beneficial to my business. Pros: The software is quite easy to use, and the invoices are of professional quality when printed. Also the ability to accept many forms of payment adds to the convenience. Cons: I wish there was a way to integrate the address book with my phone contacts app. It also is a better iPhone/ipad app than the web version. I am very pleased by the easy operation and the ability to get quick response from the help service. Pros: The system is easy to operate and it let me know when a invoice has been read and sent. The program can be used on any device even if I am not near my home computer. Cons: I would like to use pay pal on there system. The service was much easier when PayPal was attached to the system. The best thing, since slice bread. Pros: The is just great .My customers love the fact that the invoice can be paid from their email.I haven't used a paper hand written invoice in since I started using InvoiceASAP. Cons: No complaints whatsoever.This system is user friendly.The support team is very professional and polite. Pros: It's smartphones compatible and desktop compatible. It syncs up for my cpa too. I love that I can do anything on the go, or pick up where I left off at the office. Cons: I haven't figured out yet how to set my invoice/estimate numbers to load automatically. I also haven't tried contacting support though since I'm a DIY kinda person. Overall: So many things, my customers love how fast I can invoice and also I love how much easier it is to do things on the go. Pros: Its clear, very simple to use. Straight forward way to create invoices and send estimates to clients and vendors. Nothing is hidden, not tutorial needed and its track the money coming and out of your business. It can also be used injuction with your accounting and banking software. Bonus! Its very cost effective as well; very affordable. You can also charge a service fee to you clients use globalonepay. Not a huge amount thank goodness. Cons: There is nothing I don't like about the software. Not hard to learn. Worth the pricing. Overall: I have worked with other accounting and invoicing products. Some are more visually stunning, but I have never seen one that has so much to offer at a very competitive price. It does what a bookkeeper would do/ Perfect for a home or small office. The service fees are very attractive as a the low recurring fees for invoices. It also officer auto billing and print services. Did you hear me? Printing services with very professional looking invoices and receipts. I use Quickbooks (lower end) and my banking services. I don't need extra services, InvoiceASAP handles them all and keeps track of everything. Great for tax time. If you have not looked at this software you should. 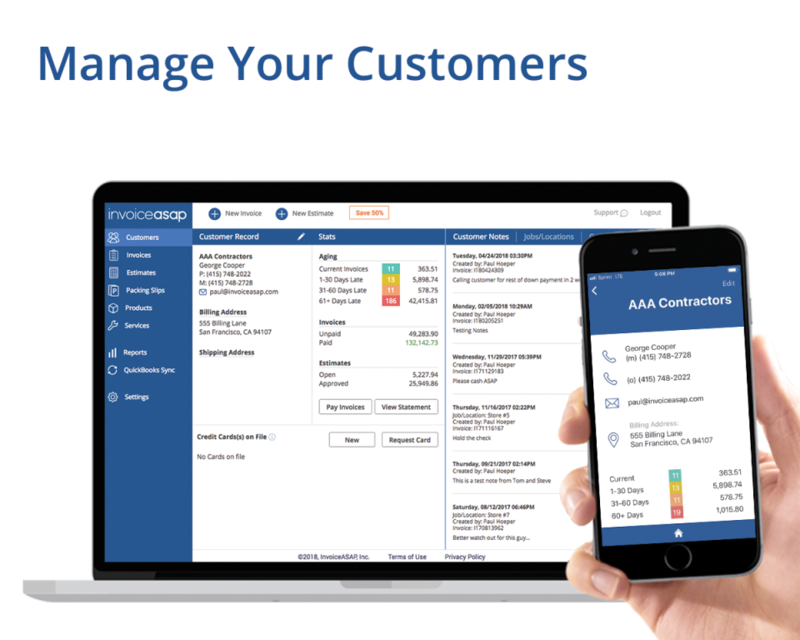 Extremely valuable tool for invoicing, inventory, and customer management. Pros: Ease of use. From Dow load, to inputting your company info...you'll be up in running in minutes. Great product. Pros: Ease of access to create invoices / estimates. Ability to integrate into my QuickBooks even though there are still bugs with this feature. Pros: Easy to use. Very handy to make an invoice and then send back to your Customers or clients. Happy to use it. Cons: Tracking old invoices are very hard. Needs other options to track old customers or invoices like with phone number or Street address.